SPN Funding is a breakout article from the main article on the State Policy Network (SPN). Please see the State Policy Network for more. While it has become an $83 million dollar right-wing empire, SPN and most of its affiliates do not post their major donors on their websites. But public documents discovered by the Center for Media and Democracy (CMD) reveal that SPN is largely funded by global corporations -- such as Reynolds American, Altria, Microsoft, AT&T, Verizon, GlaxoSmithKline, Kraft Foods, Express Scripts, Comcast, Time Warner, and the Koch- and Tea Party-connected DCI Group lobbying and PR firm -- that stand to benefit from SPN's agenda, as well as out-of-state special interests like the billionaire Koch brothers, the Waltons, the Bradley Foundation, the Roe Foundation of SPN's founder, and the Coors family -- who are underwriting an extreme legislative agenda that undermines the rights of Americans. Corporations like Facebook and the for-profit online education company K12 Inc., as well as the e-cigarette company NJOY (a new member of the American Legislative Exchange Council (ALEC)), also fund SPN, as demonstrated by its most recent annual meeting. A set of coordinated fundraising proposals obtained and released by The Guardian in early December 2013 confirm many of these SPN members' intent to change state laws and policies, referring to "advancing model legislation" and "candidate briefings." These activities "arguably cross the line into lobbying," The Guardian notes. The funding proposals are from 40 SPN members to the Searle Freedom Trust, a private foundation that funds right-wing groups such as Americans for Prosperity, ALEC, Americans for Tax Reform, and more. It is the family foundation funded by the "NutraSweet" fortune of G.D. Searle & Company, which was purchased by Monsanto in 1985 and which is now part of Pfizer. The documents were submitted to Stephen Moore, Wall Street Journal editorial board member, founder of the Club for Growth, and ALEC "scholar," who was asked to review the proposals and "identify your top 20 and bottom 20 proposals." 1.2 SPN Funders: Koch, Bradley, Roe, Coors, Etc. While, in 2007, the approximately $40 million in combined revenues of the 52 member think tanks in 45 states that were then members was less than the Heritage Foundation's budget that year of $50 million, SPN president Tracie Sharp announced in late 2007 a plan to expand think-tank revenues by $50 million by 2012. In 2010, combined revenues of SPN itself and it's (then) 59 member state think tanks was $76.1 million, according to a review of the groups' IRS forms 990 by the Center for Media and Democracy (CMD). See 2010 below for more. SPN has grown into a multi-million dollar “think tank” empire, as SPN and its member think tanks cumulatively reported over $83.2 million in revenue and $78.9 million in expenses in 2011. SPN itself saw an increase in revenue of more than $3 million from 2011 to 2012 (see below). Where is all that money coming from? Although there is no direct funding from Koch Industries or any of the Koch family foundations in that 2010 document, both Donors funds are connected to the Kochs and operate to conceal the identity of the donor. The State Policy Network has also received funding from the Claude R. Lambe Foundation (a Koch Family Foundation), the Olin Foundation, the Richard and Helen DeVos Foundation, the Bradley Foundation, the Castle Rock Foundation (Coors affiliated), the Adolph Coors Foundation, the McCamish Foundation, the JM Foundation, the Smith Richardson Foundation, and the Roe Foundation, among others. SPN has close ties with the tobacco industry. SPN, its member think tanks, and SPN related-entities such as ALEC, the Heritage Foundation, and the Cato Institute, have received significant funding from the tobacco industry that has continued through at least 2012, according to industry documents. The Nation journalist Lee Fang previously reported that SPN relied on funding from the tobacco industry throughout the 1990s, and in return assisted the tobacco industry "in packaging its resistance to tobacco taxes and health regulations as part of a ‘freedom agenda’ for conservatives." During SPN President Tracie Sharp’s tenure at the Cascade Policy Institute, Philip Morris state lobbyists worked hand-in-hand with CPI to oppose tobacco taxes. In 2001, Philip Morris Director of External Affairs Joshua Slavitt told an SPN conference that the best way to "positively impact your relationship with prospectively and current corporate contributors" was to "understand their priorities" and to make "contribution requests to suit the needs of your supporters." It appears that SPN and its member think tanks were listening, as cash from Big Tobacco to SPN continues to flow. In 2012, Altria (formerly Philip Morris) listed SPN and 21 member think tanks as recipients of corporate “charitable” contributions (which it calls “business directed giving”), although the corporation does not disclose the amount of the contributions. The Center for Media and Democracy has discovered that Altria/Philip Morris and Reynolds American contributed a total of $105,000 to SPN alone in 2010. Industry documents made publicly available by the 1998 Master Tobacco Agreement between the Attorney Generals of 46 states and the nation's five major tobacco companies and two tobacco industry associations show that SPN think tanks have been recipients of funding from Big Tobacco dating back to the early 1990s. In turn, many SPN think tanks often advocate against raising tobacco and excise taxes and work to defeat smoking bans. In Ohio, for example, the Buckeye Institute (which has received at least $60,000 in direct funding from the tobacco industry over the years, including funding from Altria as recently as 2012) has published numerous reports and articles against tobacco taxes, and the 1851 Center for Constitutional Law, formerly an offshoot litigation center of the Buckeye Institute, has led legal efforts against Ohio's public smoking ban. SPN Funders: Koch, Bradley, Roe, Coors, Etc. SPN has received funding from one of the Koch brothers' Koch Family Foundations, the Claude R. Lambe Foundation, in 2002, 2003, 2005, and 2006. In 2010, foundation funders of SPN itself included, but were not limited to, the Lynde and Harry Bradley Foundation, the Jaquelin Hume Foundation, the Chicago Community Foundation, DonorsTrust and Donors Capital Fund (large donor-directed funds with right-wing ideology; see below for more), the Vanguard Charitable Endowment Program (a donor-directed fund like DonorsTrust, although smaller; see below for more), the Gleason Family Foundation, the Searle Freedom Trust, the Armstrong Foundation, the JM Foundation, the Roe Foundation, the Lovett and Ruth Peters Foundation INC, the John William Pope Foundation, the Lowndes Foundation, the GFC Foundation, the Chase Foundation of Virginia, the Rothschild Art Foundation, the Jewish Communal Fund (a donor-advised fund), the Silverwing Foundation, the A.P. Kirby, Jr. Foundation, the Anna Paulina Foundation, and the JP Humphreys Foundation Inc., according to analysis of IRS forms 990 and foundation donation information by the Center for Media and Democracy (CMD). At the time of SPN's first annual meeting in August 1992, it was funded by the Adolph Coors Foundation, the McCamish Foundation of Atlanta, Georgia, the JM and Smith Richardson foundations in New York City, and the Roe Foundation of Greenville, South Carolina. SPN think tanks do not as a general rule publicly disclose their donors. But CMD has discovered that David Koch gave $125,000 directly to the Massachusetts-based SPN member think tank Pioneer Institute for Public Policy Research in 2007, making him the largest donor that year. A list of 2007 funders that was disclosed to the IRS was inadvertently made public. That list of funders -- featuring Pennsylvania-based Sovereign Bank, oil and gas magnate Lovett C. Peters, banker William Edgerly, retired Blue Seal Feeds CEO Dean Webster (former director of the right-wing think tank Capital Research Center), Mitt Romney's lieutenant governor Kerry Healey, and textile heir Roger Milliken in addition to David Koch -- provides an important case study in how SPN's member think tanks are funded, and by whom. Similarly, in 2012, a list of 2010 funders of an SPN member think tank in Texas, the Texas Public Policy Foundation (TPPF), that was disclosed to the IRS was inadvertently made public. It reveals that Koch Industries gave $159,834 directly to TPPF, in addition to $69,788.61 from the Claude R. Lambe Foundation, which is a Koch family foundation. If David Koch gave this much money to one state think tank in 2007, and the Kochs’ corporation gave another chunk of money to another state think tank in 2010, it begs the question of what other non-profit organizations the Koch brothers and their corporation fund directly in any given year. In the same accidentally disclosed 2010 list of TPPF funders, it is revealed that SPN itself gave TPPF $49,306.90 in 2010 (SPN's own tax filings claim that it only gave TPPF $19,500 in 2010), but what's more, Tracie Sharp, SPN's executive director, was the contact person for an additional $495,000. These two grants, for $300,000 and $195,000, were listed as being received from the "State Think Tank Fund" and the "Government Transparency Fund," respectively -- two funds about which virtually nothing is known. SPN’s leader apparently has at her disposal two funds of such significant value that she can readily use them to dispense nearly one-half of a million dollars to one think tank in Texas in one single year. It is not known how much Sharp dispensed, if anything, to other SPN think tanks that year or over many years. It is not known who or what is the source of such money that she controls but that is apparently not controlled by SPN itself. And it is not known what these untold sums have purchased or been used to accomplish. 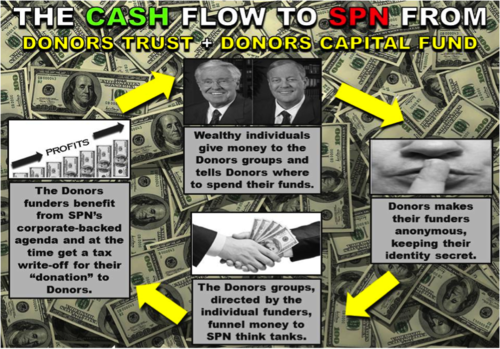 SPN received $10 million between 2007 and 2012 from two closely related funds -- Donors Trust (DT) and Donors Capital Fund (DCF) -- that are spin-offs of the Philanthropy Roundtable run by SPN board member Whitney L. Ball. They are what are called "donor-advised funds," which means that the fund creates separate accounts for individual donors, and the donors then recommend disbursements from the accounts to different non-profits. It cloaks the identity of the original mystery donors because the funds are then distributed in the name of DT or DCF. What's more, the two funds exist for "donors dedicated to the ideals of limited government, personal responsibility, and free enterprise[,] . . . always with the goal of advancing the philosophy they share with their donors." For example, a relatively unknown Koch family foundation called the Knowledge and Progress Fund gave $4.5 million to Donors Trust between 2007 and 2010, but what organizations received that funding from Donors is unknown. In addition, this cloaked money has gone to at least 51 of SPN's member think tanks between 2007 and 2011, according to the Center for Public Integrity. That includes "[t]en state-level think tanks[, which] got a total of $200,000 from Donors Trust to attend ALEC meetings in 2011[,] including the Michigan-based Mackinac Center and the Arizona-based Goldwater Institute, which introduced a raft of anti-union model bills at ALEC's spring 2012 conference." A review of funding from the Donors groups to SPN and its member think tanks reveals that the two Donors groups funneled nearly $50 million to SPN and 55 member think tanks in just the four years between 2008 and 2011. This money was specifically itemized by Donors to be used for participation in ALEC, so-called journalism programs and statehouse reporting operations, transparency projects, direct mail efforts, litigation centers, or reports against Affordable Care Act and environmental protections. According to DCF's 2011 IRS disclosure, it funded Michigan's Mackinac Center, North Carolina's John Locke Foundation, the Texas Public Policy Foundation, Pennsylvania's Commonwealth Foundation, and six other member think tanks "for participation at American Legislative Exchange Council meeting," providing a total of $200,000 to the groups for that purpose. From 2008 to 2012, DonorsTrust and Donors Capital Fund have funded at least 51 SPN member groups in almost every state, including giving start-up funds for new franchises in Arkansas, Rhode Island, and Florida, according to the Center for Public Integrity, a nonprofit investigative news organization. $738,000 to the National Taxpayers Union Foundation. Funders of SPN's individual member think tanks may be found in the articles on each think tank, linked from the article on SPN Members. Please see SPN Members for more. Not only do the Donors groups themselves fund SPN and its members, but through a network of shared board and staff members, there is a larger group of Donors-related foundations funding SPN. Searle Freedom Trust, for example, whose president and CEO Kimberly Dennis is the chairman of the board of DonorsTrust and the secretary of the board of Donors Capital Fund, gave $2,155,000 to SPN itself from 2004 to 2011, $1.31 million to California’s Pacific Research Institute from 2003 to 2011, $295,000 to the Texas Public Policy Foundation from 2007 to 2011, $275,000 to Arizona’s Goldwater Institute from 2007-2011, $121,500 to Ohio’s Buckeye Institute for Public Policy Solutions in 2009, and $30,000 to Oregon’s Cascade Policy Institute in 2004 (it also gave DonorsTrust $2.3 million from 2001 to 2011 and $150,000 to Donors Capital Fund in 2001). The William E. Simon Foundation, whose president James Piereson is DonorsTrust’s vice chairman, gave $759,250 to California’s Pacific Research Institute from 2002 to 2011 and $2,500 to Arizona’s Goldwater Institute in 2007 (it also gave DonorsTrust $895,000 from 2003 to 2011). ↑ State Policy Network, 2001 Form 990, organizational annual IRS filing, July 1, 2002. ↑ State Policy Network, 2012 Form 990, organizational annual IRS filing, May 6, 2013. ↑ John J. Miller, Fifty Flowers Bloom: Conservative think tanks — mini--Heritage Foundations — at the state level, National Review, November 19, 2007. ↑ 6.0 6.1 State Policy Network, 2010 funders document, on file with CMD. ↑ State Policy Network, 2013 Annual Meeting Agenda, September 24-27, 2013, on file with CMD. ↑ Center for Media and Democracy, Koch Family Foundations, SourceWatch.org, accessed December 2012. ↑ People for the American Way, State Policy Network, "Right Wing Watch" think tank profile, accessed August 18, 2011. 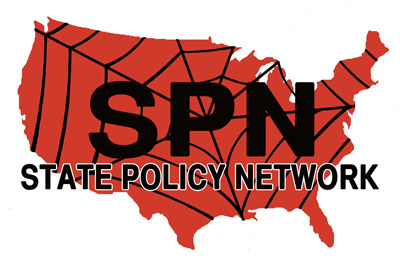 ↑ 10.0 10.1 State Policy Network, SPN News, organizational newsletter, Fall 2002. ↑ 11.0 11.1 Altria, Recipients.pdf 2012 Recipients of Charitable Contributions from Altria Family of Companies, organizational document, accessed November 2013. ↑ 12.0 12.1 Lee Fang, The Right Leans In, The Nation, March 28, 2013. ↑ Joshua Slavitt, Director, External Affairs, Philip Morris Management Corp., State Policy Network Annual Meeting Address, October 6, 2001, archived in the Legacy Tobacco Documents Library, accessed November 2013. ↑ University of California, San Francisco, Legacy Tobacco Documents Library, academic archive website, accessed November 2013. ↑ ProgressOhio and Center for Media and Democracy, Smoke Screen: The Buckeye Institute, organizational report, November 13, 2013. ↑ David Owsiany, Cigarette tax spike isn't Ohio's financial solution, Columbus Business First, May 6, 2002. ↑ Buckeye Institute, 2009 IRS Form 990, organizational annual IRS filing, September 16, 2010. ↑ Columbus bar files lawsuit against smoking ban, Associated Press, September 20, 2009. ↑ Claude R. Lambe Foundation, 2002 Form 990, organizational IRS filing, available via Guidestar.org, 2002. ↑ Claude R. Lambe Foundation, 2003 Form 990, organizational IRS filing, available via Guidestar.org, 2003. ↑ Claude R. Lambe Foundation, 2005 Form 990, organizational IRS filing, available via Guidestar.org, November 15, 2006. ↑ Claude R. Lambe Foundation, 2006 Form 990, organizational IRS filing, available via Guidestar.org, November 15, 2007. ↑ Lynde and Harry Bradley Foundation, 2010 Form 990, organizational IRS filing, available via Guidestar.org, November 14, 2011. ↑ Jaquelin Hume Foundation, 2010 Form 990, organizational IRS filing, available via Guidestar.org, July 7, 2011. ↑ Chicago Community Foundation, 2010 Form 990, organizational IRS filing, available via Guidestar.org, August 11, 2011. ↑ John R. Mashey, Fake science, fakexperts, funny finances, free of tax 2, DeSmog Blog report, updated October 23, 2012, p. 74. ↑ Vanguard Charitable Endowment Program, 2010 Form 990, organizational IRS filing, available via Guidestar.org, November 10, 2011. ↑ Gleason Family Foundation, 2010 Form 990, organizational IRS filing, available via Guidestar.org, November 11, 2011. ↑ Searle Freedom Trust, 2010 Form 990, organizational IRS filing, available via Guidestar.org, November 15, 2011. ↑ Armstrong Foundation, 2010 Form 990, organizational IRS filing, available via Guidestar.org, November 14, 2011. ↑ JM Foundation, 2010 Form 990, organizational IRS filing, available via Guidestar.org, November 15, 2011. ↑ Roe Foundation, 2010 Form 990, organizational IRS filing, available via Guidestar.org, May 9, 2011. ↑ Lovett and Ruth Peters Foundation, Inc., 2010 Form 990, organizational IRS filing, available via Guidestar.org, August 12, 2011. ↑ John William Pope Foundation, 2009 Form 990, organizational IRS filing, available via Guidestar.org, November 15, 2010. ↑ Lowndes Foundation, 2010 Form 990, organizational IRS filing, available via Guidestar.org, May 9, 2011. ↑ FGC Foundation, 2010 Form 990, organizational IRS filing, available via Guidestar.org, December 16, 2010. ↑ Chase Foundation of Virginia, 2010 Form 990, organizational IRS filing, available via Guidestar.org, June 7, 2011. ↑ Rothschild Art Foundation, 2010 Form 990, organizational IRS filing, available via Guidestar.org, November 8, 2011. ↑ Jewish Communal Fund, 2010 Form 990, organizational IRS filing, available via Guidestar.org, May 15, 2012. ↑ Silverwing Foundation, 2010 Form 990, organizational IRS filing, available via Guidestar.org, November 9, 2011. ↑ A.P. Kirby, Jr. Foundation, [http://www.guidestar.org/FinDocuments/2010/222/922/2010-222922817-078a6c12-F.pdf May 14, 2011. ↑ Anna Paulina Foundation, 2010 Form 990, organizational IRS filing, available via Guidestar.org, May 9, 2011. ↑ JP Humphreys Foundation, Inc., 2010 Form 990, organizational IRS filing, available via Guidestar.org, December 14, 2010. ↑ 45.0 45.1 Forrest Wilder, Revealed: The Corporations and Billionaires that Fund the Texas Public Policy Foundation, TPPF Donor List, Texas Observer, August 24, 2012. ↑ State Policy Network, IRS Form 990, organizational tax filing, May 7, 2011. ↑ 47.0 47.1 Paul Abowd, Center for Public Integrity, Donors use charity to push free-market policies in states, Consider the Source (organizational publication), February 14, 2013. ↑ Center for Media and Democracy, DonorsTrust and Donors Capital Fund Grant Recipients, SourceWatch, accessed November 2013. ↑ DonorsTrust, IRS 990s, 2008-2011; and Donors Capital Fund, IRS 990s, 2008-2011. See DonorsTrust and Donors Capital Fund Grant Recipients on SourceWatch. ↑ 53.0 53.1 John R. Mashey, Fake science, fakexperts, funny finances, free of tax 2, DeSmog Blog report, updated October 23, 2012, p. 74. ↑ American Bridge 21st Century Foundation, Funder: Searle Freedom Trust, Bridge Project conservative transparency website, accessed November 2013. ↑ American Bridge 21st Century Foundation, Funder: William E. Simon Foundation, Bridge Project conservative transparency website, accessed November 2013. ↑ ProPublica 2015 Form 990, annual organizational IRS filing, Sept 8, 2016. ↑ ProPublica 2014 Form 990, annual organizational IRS filing, Sept 19, 2015. ↑ ProPublica 2013 Form 990, annual organizational IRS filing, May 13, 2014. ↑ State Policy Network, 2012 Form 990, annual organizational IRS filing, May 6, 2013. This page was last edited on 15 October 2018, at 22:03.